Goat water used to be the national dish of Saint Kitts and Nevis, until a competition was launched to find a more modern dish to represent the country. 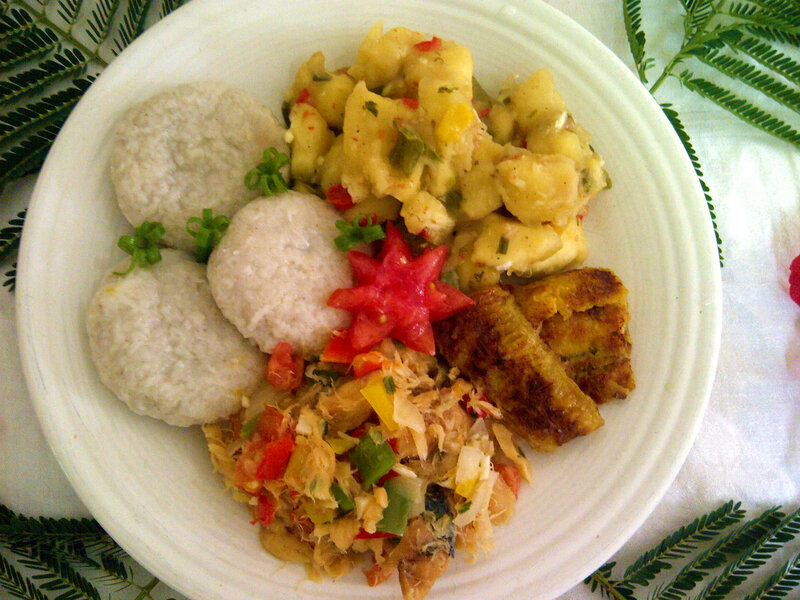 The worthy winner of the competition, Jacqueline Ryan, created this dish with local vegetables, coconut and saltfish, a dish that represents well the diverse ingredients that Saint Kitts and Nevis have to offer. Boil the fish in fresh water until tender, for about 20 minutes. Drain it before removing bones, scales and flakes. Heat oil in a large pan. Add peppers, spring onions, onion and garlic. Cover and cook over low heat for 5 minutes, stirring occasionally. Add the tomatoes and simmer over medium heat for 2 to 3 minutes. Add saltfish, butter, salt and pepper. Cover the stew and simmer over low heat for 5 minutes. Combine all ingredients in a bowl. Toss until mixed. Fry in batches until golden brown and cooked. Place flour, coconut, salt, butter and oil in a bowl. Gradually stir in water to make a stiff dough. Turn onto a lightly floured board and knead for about 2 minutes. Make dumplings in desired shape. Slide dumplings into boiling water. Cover and cook for about 10 to 15 minutes. Melt butter in a heavy pan over medium heat, then add oil. Add onions and cook 5 to 8 minutes until golden, stir often. Add garlic, thyme and chopped peppers, sauté for 30 seconds. Remove from heat and add breadfruit with chicken broth or other prepared liquid. Toss gently to blend and heat through. Season to taste with salt and pepper. Serve with dumplings, saltfish and spicy plantains. Michelle Flanders comes from Saint Kitts and Nevis. She likes to help others, and does so every day as her job entails caring for adults with special needs. Michelle has a passion for cooking. She thanks her grandmother for teaching her. Goat Water has always been the national dish of Montserrat. It certainly won’t be national dish for two islands. Montserrat’s goat water bears a striking resemblance to Irish Stew which is indicative of the island’s deep Irish past.